True Blue Canadian: Who was the winner? 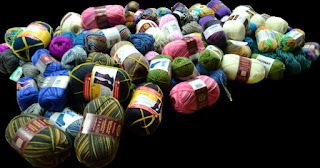 In November of last year, I had a blog post whereby you (North Americans) could enter a contest and win "Socks for Life" from Yarn Canada. The contest ended on December 15th. Well the runners up and winner can be found here. And the winner, what a fantastic lady, and this wool will be knitted and given to those who will so appreciate a gift. How wonderful! She was the perfect choice!